Do you have questions about the creative process? Need advice about character development? Meet with Aprilynne Pike, Glendale's Writer in Residence, during her Creative Space office hours for writing inspiration and feedback. Do you have questions about the creative process? Need advice about character development? Meet with Aprilynne Pike, Glendale's Writer in Residence, in the adult department during her office hours for writing inspiration and feedback. ﻿New York Times bestselling authors Lauren Kate and Aprilynne Pike present the latest installments in their romantic fantasy series. In Waterfall, Lauren Kate presents the second entry in the Teardrop series. Eureka's tears have flooded the earth, and now Atlantis is rising, bringing with it its evil king, Atlas. Eureka is the only one who can stop him. Trying to make sense of the dark world her sorrow has created, a soul-crushing secret is revealed: if she's strong enough, Eureka can draw on this knowledge to defeat Atlas,but she'll have to give up everything--even love. ABOUT THE AUTHORS Lauren Kate is the internationally bestselling author of the Teardrop series, the Fallen novels: Fallen, Torment, Passion, Rapture, and Fallen in Love, and The Betrayal of Natalie Hargrove. Her books have been translated into more than 30 languages. She lives in Los Angeles with her husband. Visit her online at LaurenKateBooks.net. Aprilynne Pike has been spinning stories since she was a child with a hyperactive imagination. She completed her BA in creative writing at the age of twenty at Lewis-Clark State College in Lewiston, Idaho. She currently lives with her husband and children in Arizona. 3 pm | FRIDAY, MAY 23 Aprilynne Pike Sleep No More READING, Q&A, BOOKSIGNING Note: This is a free, offsite event at the Prescott Valley Public Library, 7401 E Civic Circle, Prescott Valley, AZ Hear Aprilynne Pike read selections from her newest book, Sleep No More. Aprilynne is best known for her first novel Wings, which debuted as a New York Times bestseller and reached the #1 spot on the Children's Best Seller list, making her the best-selling non-celebrity children's author to debut in 2009. The blockbuster film Inception meets Lisa McMann's Wake trilogy in this dark paranormal thriller from #1 New York Times bestselling author Aprilynne Pike. This novel is also perfect for fans of Kelley Armstrong, Alyson Noel, and Kimberly Derting. Charlotte Westing has a gift. She is an Oracle and has the ability to tell the future. But it doesn't do her much good. Instead of using their miraculous power, modern-day Oracles are told to fight their visions—to refrain from interfering. And Charlotte knows the price of breaking the rules. She sees it every day in her wheelchair-bound mother and the absence of her father. But when a premonition of a classmate's death is too strong for her to ignore, Charlotte is forced to make an impossible decision: continue following the rules or risk everything—even her sanity—to stop the serial killer who is stalking her town. Oracles see the future. But they are never supposed to interfere. Charlotte learned that the hard way. If she hadn't tried to change one of her childhood visions, her mother wouldn't be in a wheelchair—and her father would still be alive. Since that fateful accident, Charlotte has tried to suppress her visions. But when she receives a premonition of a classmate's murder, she knows she can no longer sit idly by. Then she meets Smith, a man who not only knows Charlotte's secret but who also claims to have a way for her to manipulate her visions to change the future. But doing this means Charlotte must put herself in the path of the murderer. Changing Hands presents two young adult authors, Aprilynne Pike discusses her novel, Sleep No More and Suzanne Young presents The Treatment. In Aprilynne Pike's href="/work/14511524">Sleep No More, Charlotte Westing has a gift. She is an Oracle and has the ability to tell the future. But it doesn't do her much good. Instead of using their miraculous power, modern-day Oracles are told to fight their visions--to refrain from interfering. And Charlotte knows the price of breaking the rules. She sees it every day in her wheelchair-bound mother and the absence of her father. But when a premonition of a classmate's death is too strong for her to ignore, Charlotte is forced to make an impossible decision: continue following the rules or risk everything--even her sanity--to stop the serial killer who is stalking her town. In Suzanne Young's The Treatment, the sequel to The Program, Sloane and James are on the run after barely surviving the suicide epidemic and The Program isn't ready to let them go. Escaping with a group of troubled rebels, they will have to figure out who they can trust, and how to take down The Program. But for as far as they've come, there's still a lot they can't remember. The key to unlocking their past lies with The Treatment--a pill that can bring back forgotten memories, but at a high cost. Ultimately when the stakes are at their highest, can Sloane and James survive the many lies and secrets surrounding them, or will The Program claim them in the end? Aprilynne Pike, the bestselling author of the Wings series, has been spinning faerie stories since she was a child with a hyperactive imagination. She completed her BA in creative writing at the age of twenty at Lewis-Clark State College in Lewiston, Idaho. Aprilynne lives with her husband and children in Phoenix. Suzanne Young, who is originally from New York, moved to Arizona to pursue her dream of not freezing to death. She currently resides in Tempe, where she teaches high school English. When not writing obsessively, Suzanne can be found searching her own tragic memories for inspiration. Suzanne is the author of several books for teens, including A Need So Beautiful and A Want So Wicked. Learn more at her blog (suzanne-young.blogspot.com) or follow her on Twitter (@suzanne_young). Aprilynne Pike's book Earthbound was available from LibraryThing Early Reviewers. 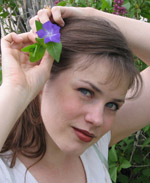 Aprilynne Pike is currently considered a "single author." If one or more works are by a distinct, homonymous authors, go ahead and split the author. Aprilynne Pike is composed of 3 names. You can examine and separate out names.